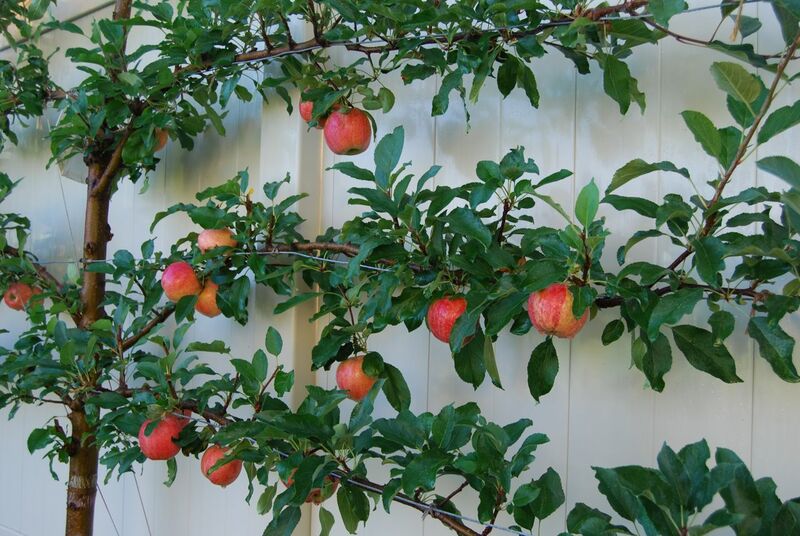 It’s time for an update on the apple espalier as the Fall season gets underway. 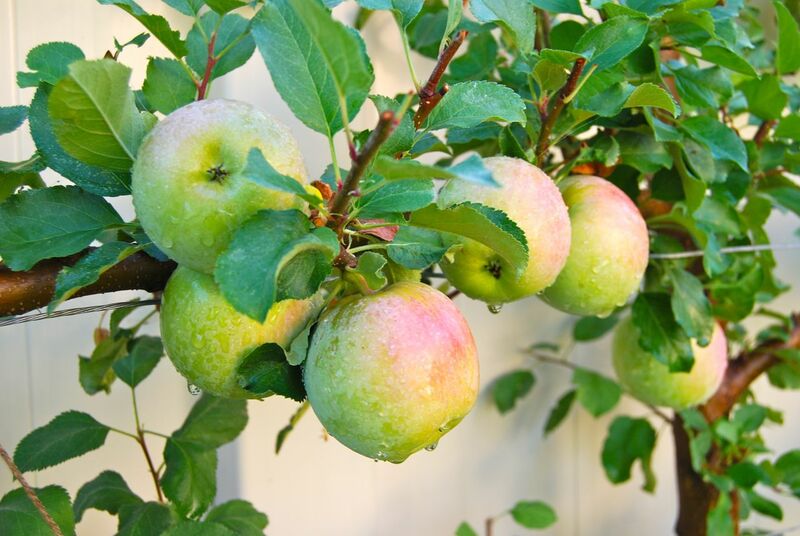 As much as I hate to acknowledge there’s limited time to celebrate the last hurrahs of the growing season in my zone 6 garden I must start somewhere…and what could be better than starting with the Kings of Fall –Apples! Well, here it is…the promise developed into apple-icous loveliness. I know I am over-excited about something as simple as apples but sometimes simple pleasures are the best right? Here’s my Gala apple tree sporting 40+ beautiful apples in only its 2nd year. Here’s my Fuji apple tree showing 70+ apples in its 3rd year. The apples are the crown jewels of the edibles within my garden this year. This is because they required very little maintenance, increased their production more than I care to figure out (we only had four last year) and taste amazing! 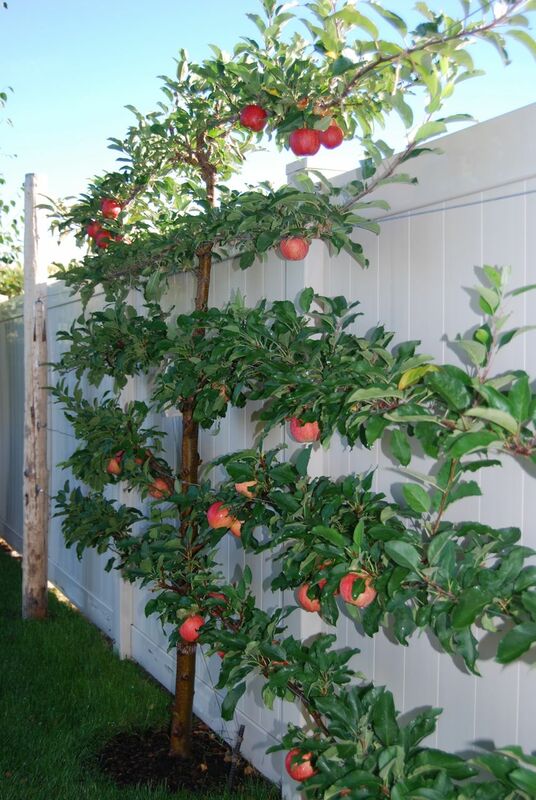 A+ for the apple espalier! 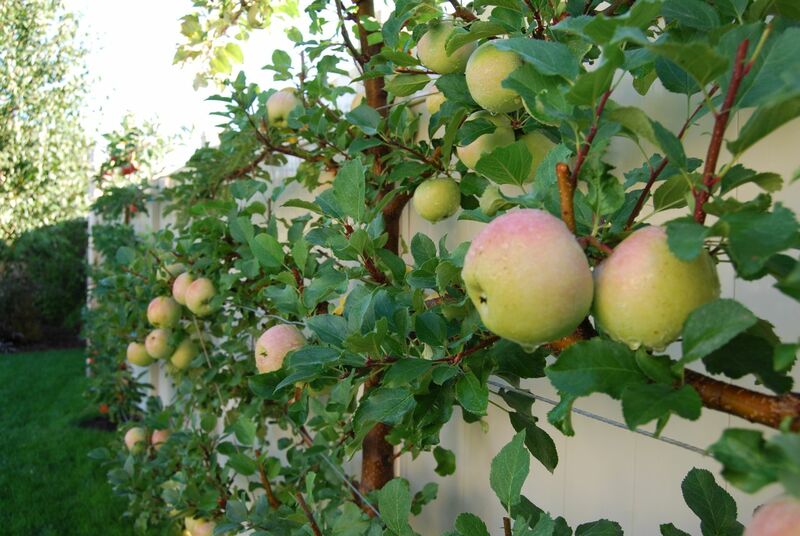 For those of you that may have started your own apple espalier, (the apple espalier was one of my most popular posts) I want to mention I trimmed my espalier twice during the entire growing season. Once mid-summer and again a week ago. I also used disposable codling moth traps for use in organic gardens to know when codling moths were present. The idea behind these traps is to identify when codling moths are present so that if you spray it is only at the time of moth activity. However, due to trips and other distractions I only sprayed based on the trap results one time. What did I spray? A serum from my local garden store containing spinosad (the only active ingredient) which controls codling moth and is approved for USDA organic produce. I am thrilled that I only used the spray one time and don’t have any loss from worms. Oh WOW!!! 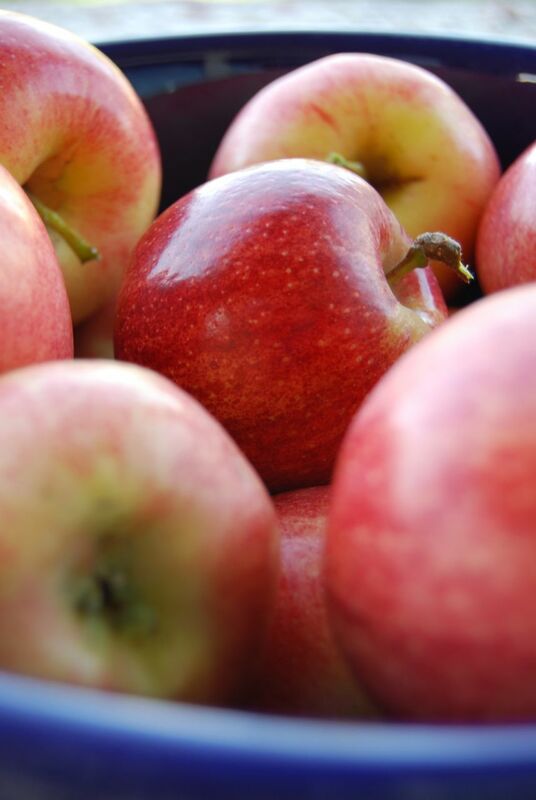 Not only do you get beautiful apples from it, but it looks beautiful too! A stunning feature that gives you fruit … what not to love about this? mmmmmmm…they look beautiful and yummy, I can’t wait to sink my teeth into some of these. Save me a few. I actually had one for breakfast this morning and it was SOOOOO YUMMY! Ill be taking one as a snack for my trip to Arizona. Our apple tree esplaier is a bit bigger now and a little out of control, but more importantly, how do you keep the birds from eating at least a portion of all the apples? They always flock to our tree and take “bites”. Do you cover or net? Your apples are beautiful! Congratulations! Thanks everyone for the kind comments! I am really happy with this feature in my garden. Pat, to answer your question…no, I do not net or cover with anything and I have not had a problem with birds getting a part of the apple action! Since you and I live in the same general area I am not sure why this is? Maybe it is because my espalier has only been around 2-3 years and they have not discovered it yet or I do not get the same type of birds in my garden. 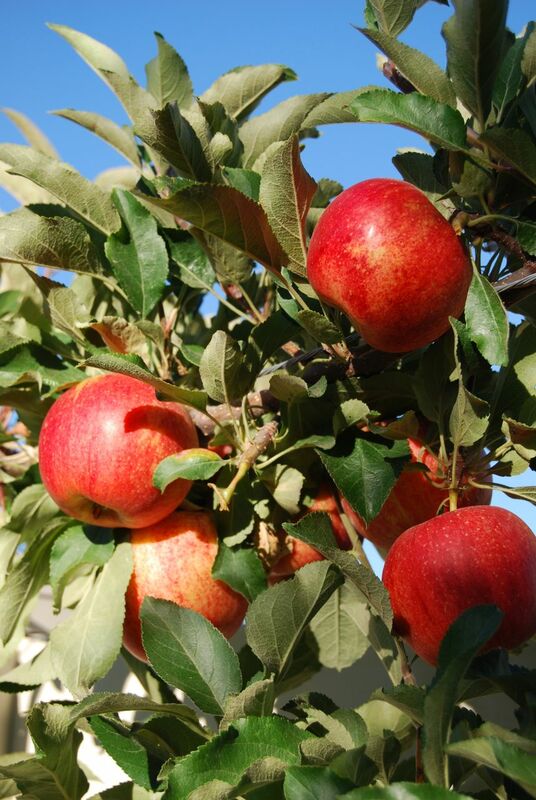 What types of birds are eating your apples? Very impressive! I love the look of espaliers. And I’m even more impressed with your willingness to keep them organic. 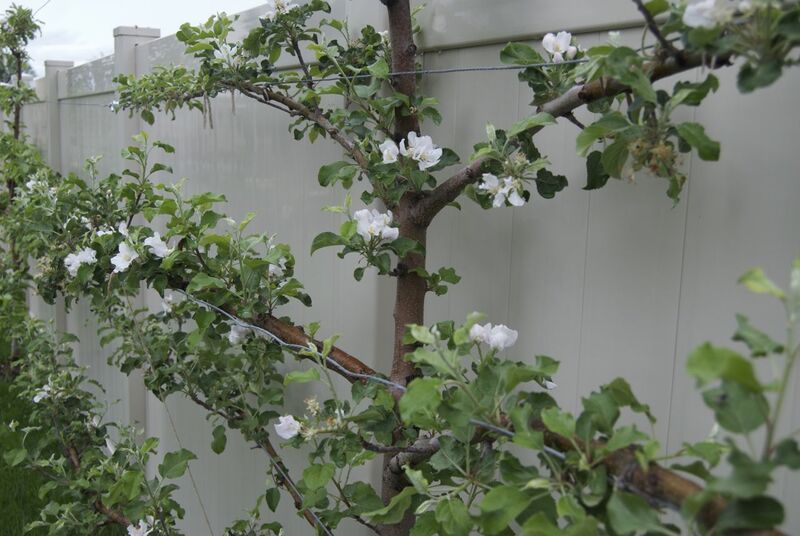 Did you create the espalier yourself, or did you buy one of pre-espaliered (not sure if that is a word) trees from the nursery? Hi there, I bought a young tree that was not already espaliered but had a just a few branches and I could tell it would not be hard to train it into a simple espalier pattern.